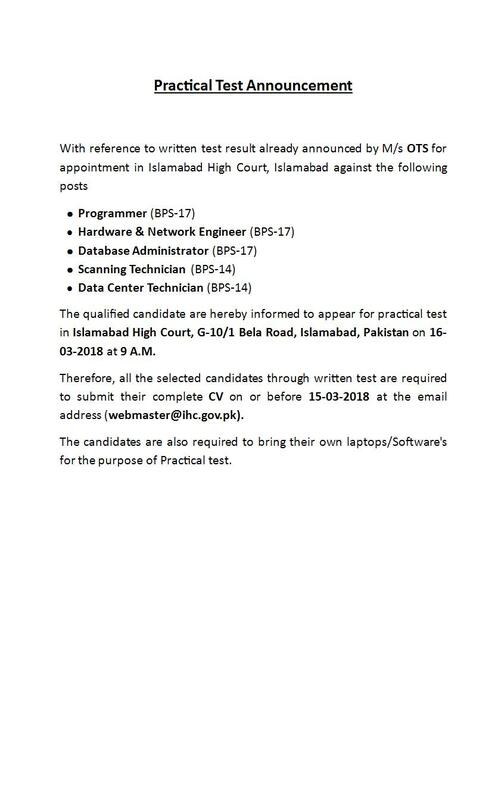 The qualified candidates are hereby informed to appear for practical test in Islamabad High Court, G-10/1 Bela Road, Islamabad, Pakistan on 16-03-2018 at 9 A.M. Therefore, all the selected candidates through written test are required to submit their complete CV on or before 15-03-2018 at the email address (webmaster@ihc.gov.pk). The candidates are also required to bring their own laptops/Software's for the purpose of Practical test.